I suppose I was 12…. 18 years ago. Meet my new favourite sweater. 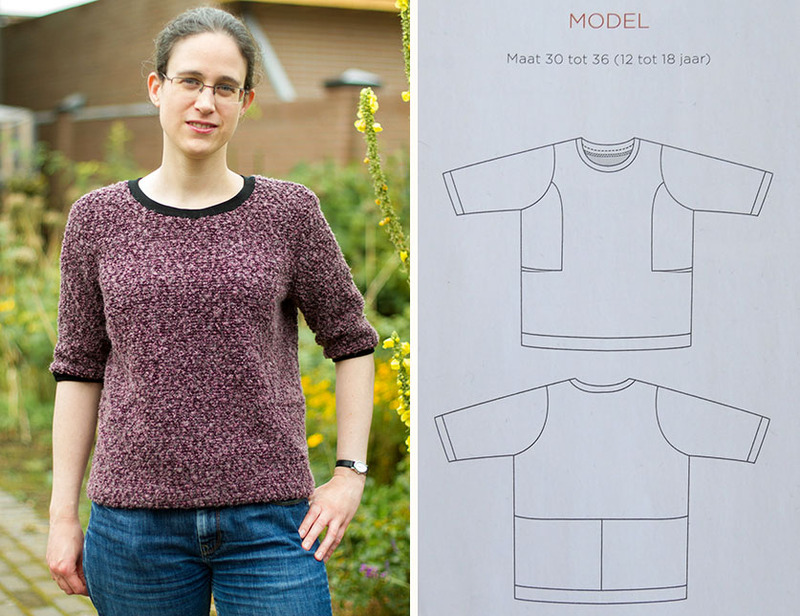 The Indigo sweater from the July/August 2015 issue of La Maison Victor, a Flemish sewing magazine. I didn’t know this magazine existed until my co-workers gave me this issue for my birthday. 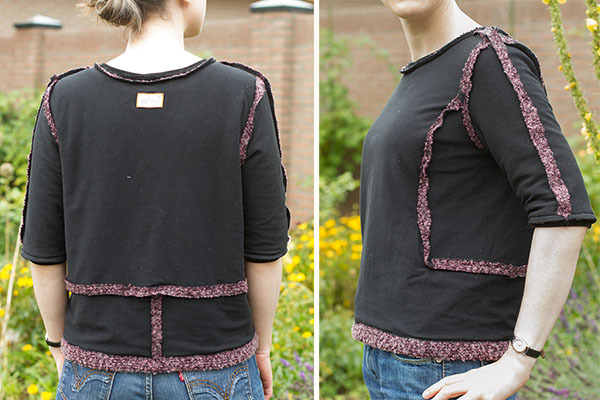 When I saw the shapes of the pattern pieces for this sweater I was sold. It is a guest-pattern by Valerie Boone, author of Remi & Cosette for teens, a book with sewing patterns for teenagers. The Indigo sweater pattern is also featured in this book. Since it was designed for teenagers the size range is, unfortunately, rather limited. I made the largest size, 36, which corresponds to a 88 cm bust. 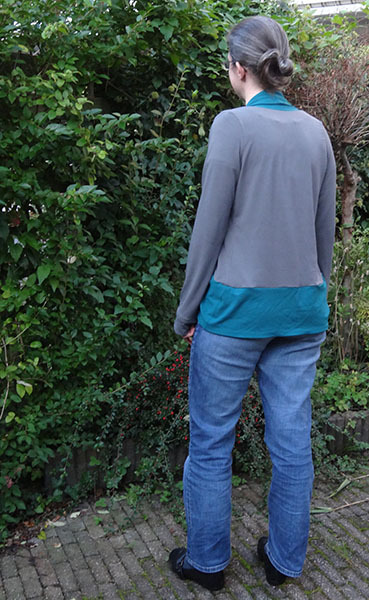 This sweater has no side seams, the only shaping comes from the princess seams on the front. 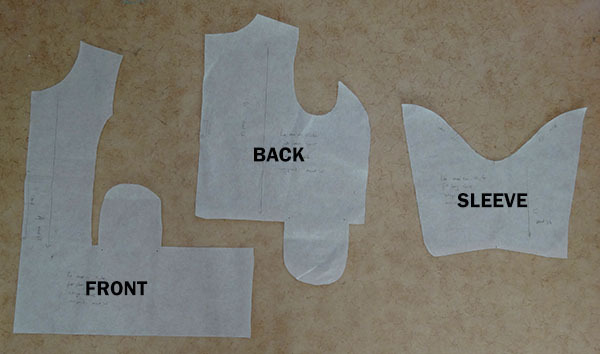 The front and back pieces are sewn together in one continuous seam, which even includes the pockets. 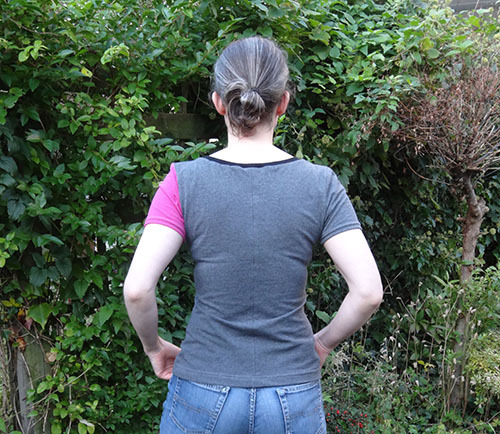 The sleeve seam is not on the bottom of the sleeve but is sewn continuously with the shoulder seam. I think the whole construction is quite ingenious. I made a muslin and one of the first things I did was to sew the pockets closed. I really like them in theory, but on a person with hips I thought they added too much emphasis on said hips. I moved the shoulder seam forward by 1.5 cm and also shifted this seam on the sleeve since shoulder and sleeve are sewn together. 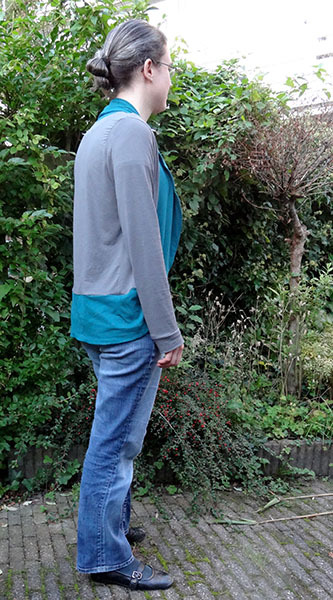 The sweater length was reduced by 2 cm at the waist. Adjusted pattern. Pockets removed. 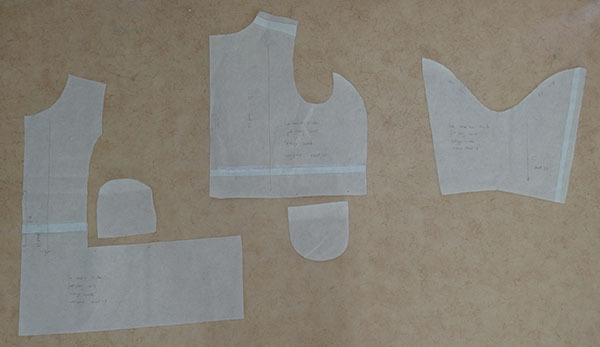 Shoulder and sleeve seam moved 1.5 cm forward. Reduced length 2 cm. 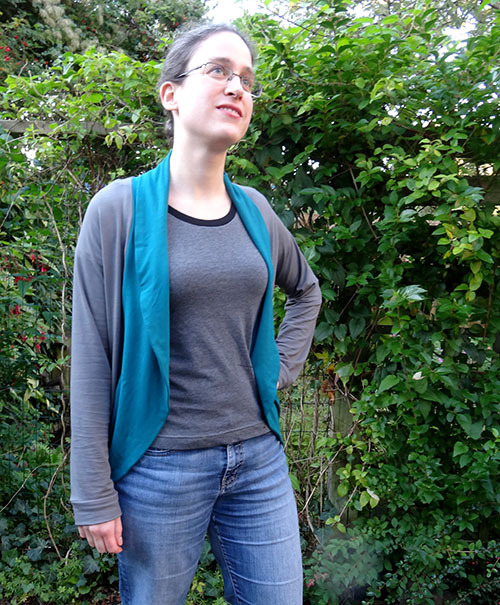 The fashion fabric is a mystery knit that came from the stash of a friend’s mother. She decided that she wasn’t going to sew anymore and wanted to get rid of the fabric she still had, lucky me. I thought it might not be opaque enough on its own and feel scratchy against my skin so I decided to underline it with black laguna jersey. To do this, I cut all pattern pieces twice, layered underlining and fashion fabric on top of each other, pinned so that nothing would shift and then stitched with a wide zigzag stitch around all edges. This basically turns the two layers into one which is much easier during construction later on. The seams were stitched with a narrow zig zag stitch using my walking foot. Instead of pressing the seam allowances to one side as instructed, I pressed them open because I found the 4 layers of fabric too bulky otherwise. 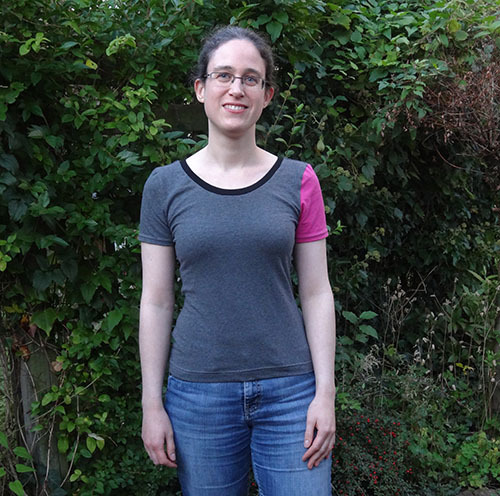 The neckline and sleeves are finished with black ribbing. 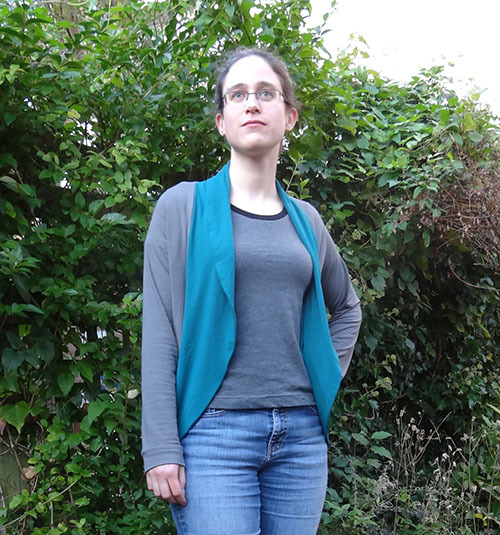 The bottom hem should also have been finished with ribbing, but I did an invisible hand sewn hem instead. 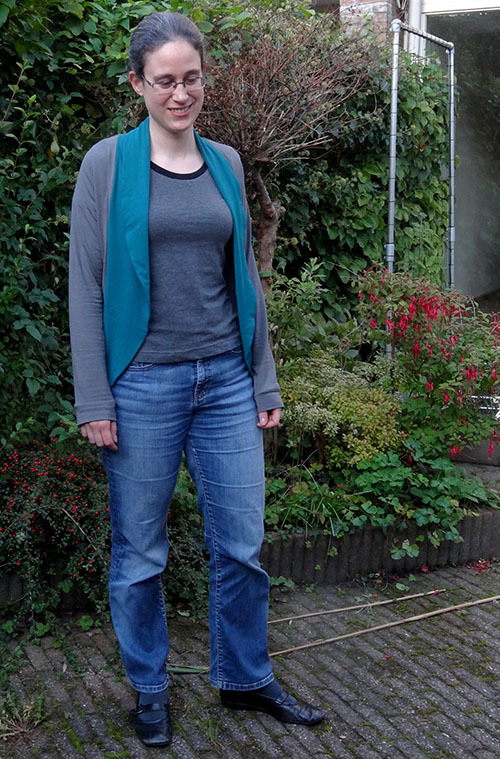 When I was testing fit during construction I already liked it a lot without the ribbing and I realized that I don’t really like the ribbing on the hoodies that I occasionally wear so decided to skip it. 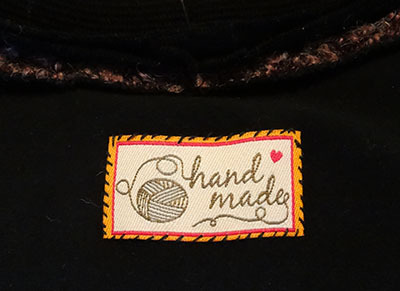 One of my co-workers gave me some tags to use for my handmade items and I sewed one to the interlining of the back. All outside pictures were taken by my brother who I should probably turn into my official blog photographer because he only took a couple and nearly all of them turned out great.